I know right? Dye your eyelashes? Why do you really need that. Well, let me tell you why! Because, hi...it's like wearing mascara all of the time. At the beach. In your bed. At the gym. So obviously you can't really go wrong. It's a super simple process too. The dye is applied with your eyes closed. You sit for ten minutes, and then you're done. But if you have watery eyes like I do, be careful. The dye can drip down your face. Just tell your esthetician beforehand! And it's usually a quick, cheap add on service that your salon can throw in while your already there. 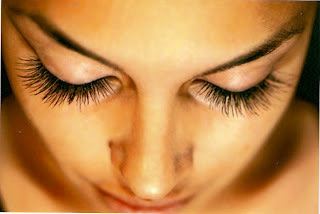 Conclusion: dying your eyelashes is cool.